Some intense work has been done at LMRO on the weekend. Trenching was put in for power and signal conduits and water drainage to fix the problem with cable pits filling with water. In the next few days the trenches will be filled in and the land put back to usable condition. A great effort from Clint, Phil, Steve and John. Christmas Eve is tonight so all of us in the ASV Radio Astronomy Section would like to wish everyone a safe and happy Christmas. Its an exciting day here at LMRO, Heathcote, Central Victoria. The tower for our Dish has been delivered and the crane has placed it on the foundation bolts. 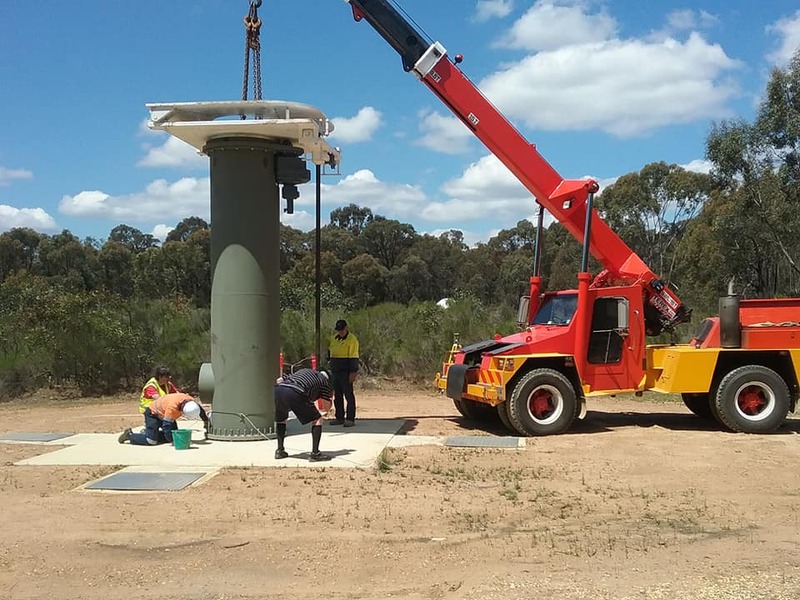 The tower has been aligned and bolted down. A cement grout is being put in to the gap between the steel and the concrete foundation. 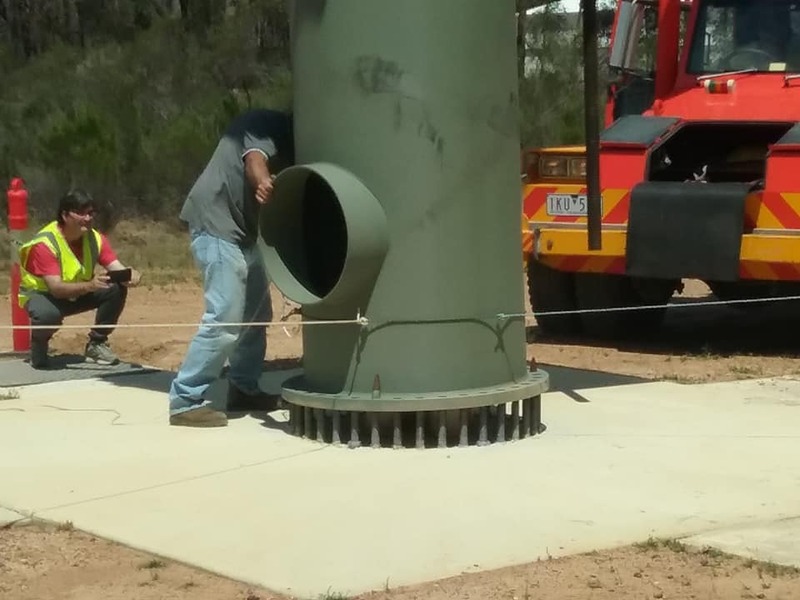 The top of the tower has a large bearing allowing the mounting plates to swivel. 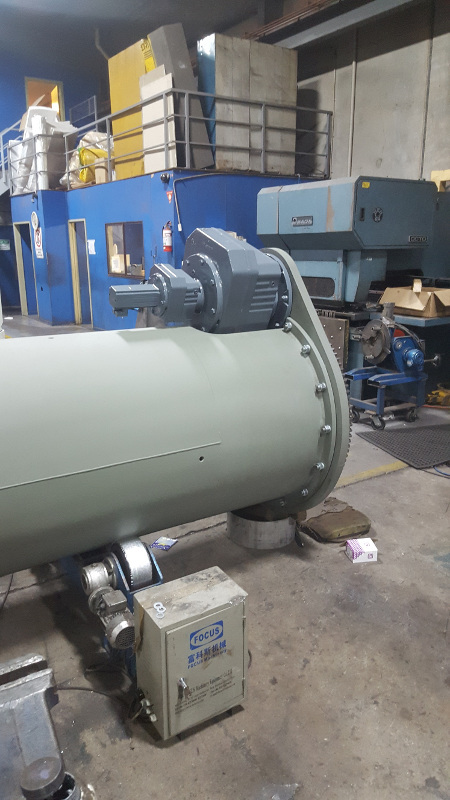 The azimuth motor meshes with the bearing to point it in a different direction. Another motor is connected to a long screw that lifts the dish from horizon to zenith. Click on the pictures to see the larger image. 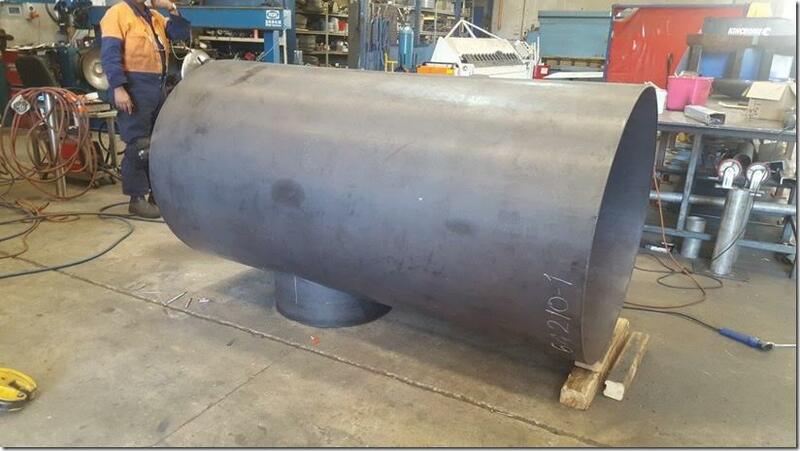 Some new photos have come through after a recent visit to the steel fabrication company doing the build of the tower for the dish. 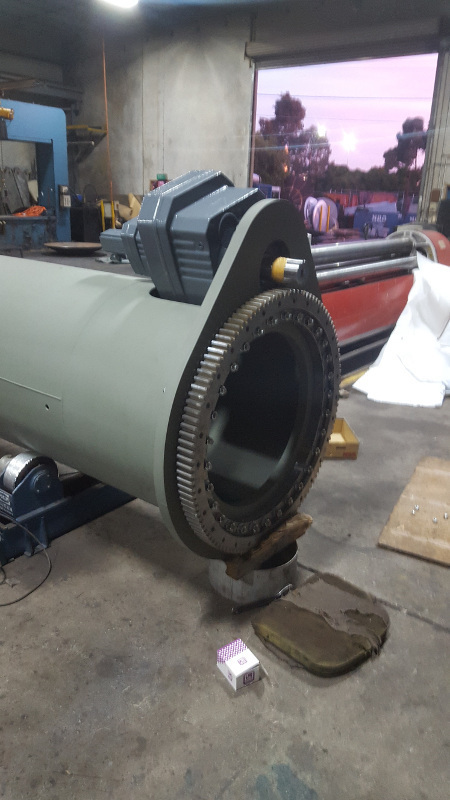 The azimuth motor and gearbox assembly has been mounted to the top plate along with the azimuth bearing. 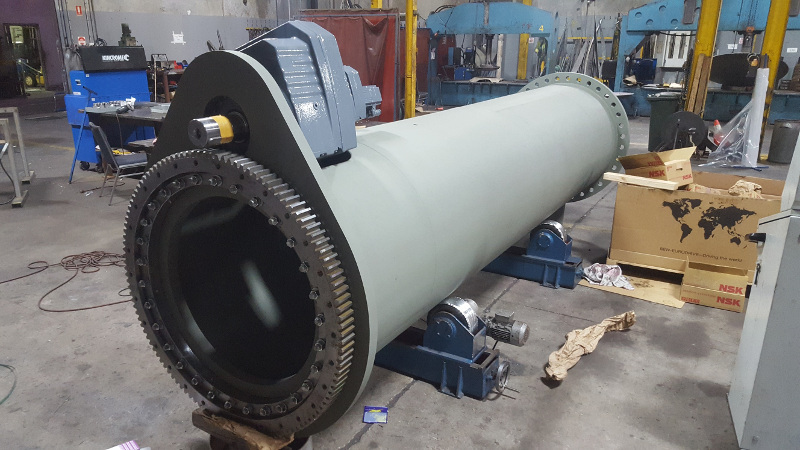 A drive sprocket will be fitted to the motor drive shaft to mesh with the teeth on the azimuth bearing. 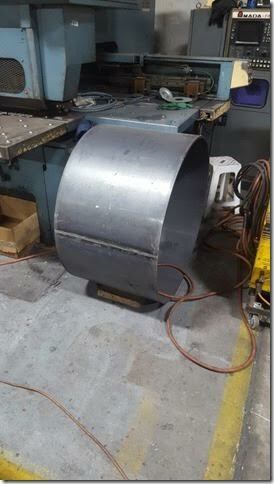 We are also in the process of replacing the transparent dome on the All-Sky camera. The old polycarbonate dome was weathered and discolored and badly in need of replacement. A new glass dome is currently being made but proving difficult to size correctly. We hope to have the camera working again in a few weeks. Over the New Year break a lot of work has been done by our team at the LMRO site. 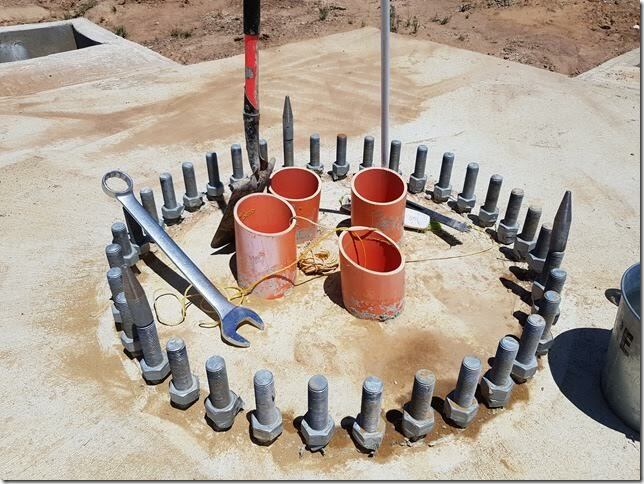 The final North side cable pit concrete has been completed and guide pins have been fitted to the tower bolts. 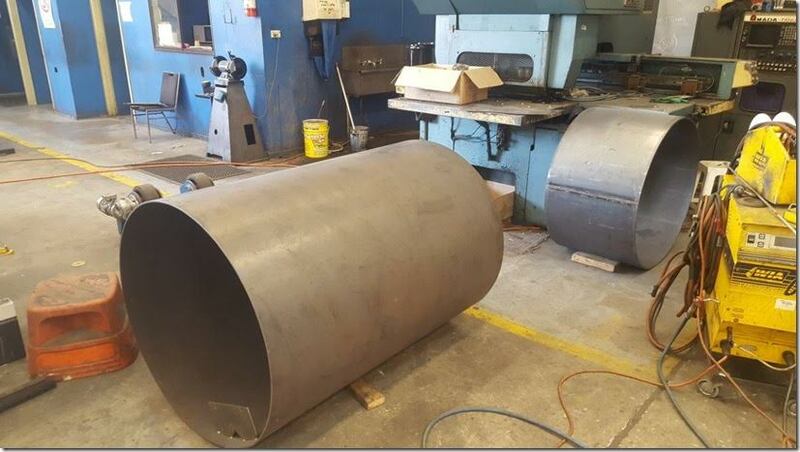 Fabrication of the tower is well underway with welding being done this week on the inspection hatch and the mounting ring. Delivery might be within the first two weeks of February. 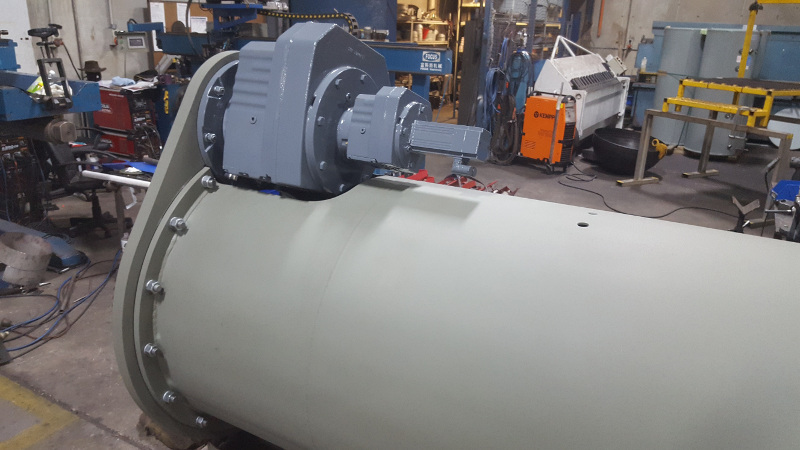 Installation of our Whistler Receiver was completed in October after a trench was dug and wiring carrying the audio from the receiver was laid. The computer was installed and set up for audio streaming to the website. The software will eventually monitor the audio for Whistlers and record the events with recordings available for downloading. 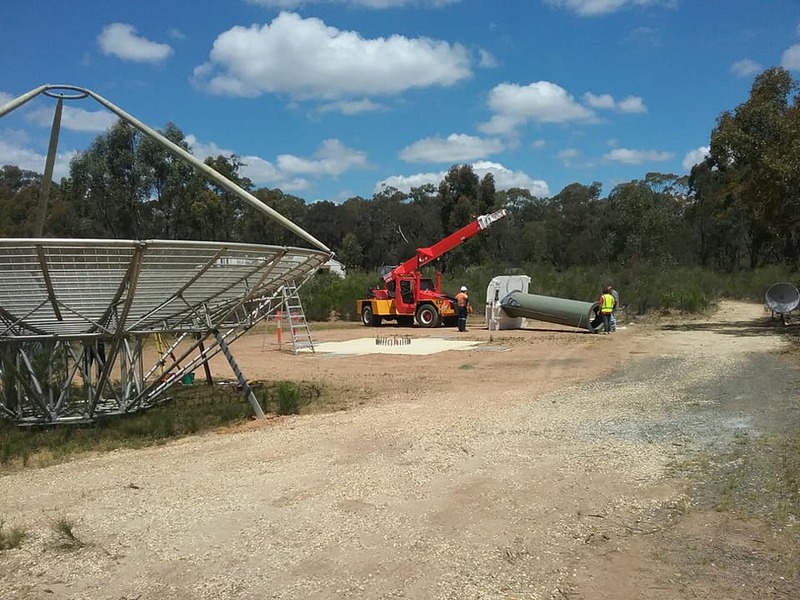 The Dish tower is now being built and we hope delivery to site will take place by the end of November. 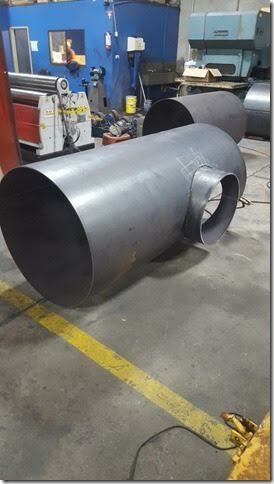 With luck it will be mounted on the foundation by the start of December in time for the Christmas Star-b-cue. April 2017: Bring it on! Saturday 8th April 2017:Stage 1 is now complete! - After delivery of three cement trucks worth of concrete the pour is complete. 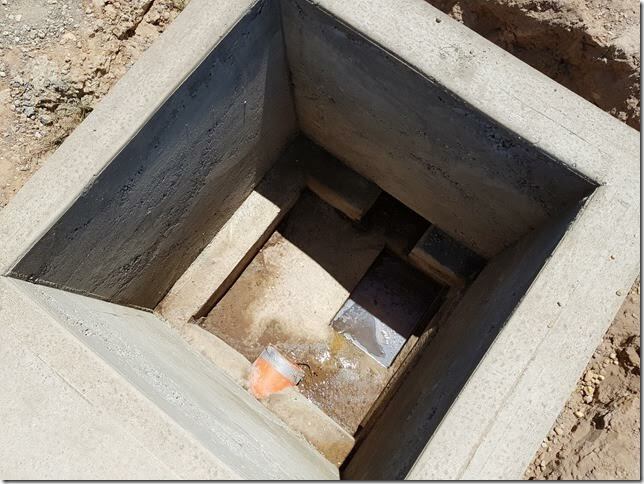 Some work was needed to level out the concrete and some was removed to provide a more level surface. Over the next few weeks the block will cure and give us a great support for the tower section once it is built. In the center our four 150mm orange conduits rise up to allow routing of power and signal cables. We need to dig trenches at the start of the conduit and fit the rest of the conduit back to the building. The majority of the preparation of the foundation was done by Clint and Phil, with Stephen Bentley and Robert putting together the cable conduits and some digging in the rock hard soil. Once the Dish is complete we should be able to make some great discoveries! On the weekend of the 4th March 2017 a very successful Messier Star Party was held with over 150 attendees. We had several big groups of visitors drop in at LMRO to find out what we are about. Although a nasty little storm came through around 5pm on Saturday night the sky was mostly clear by midnight and many members had some reasonable viewing sessions. 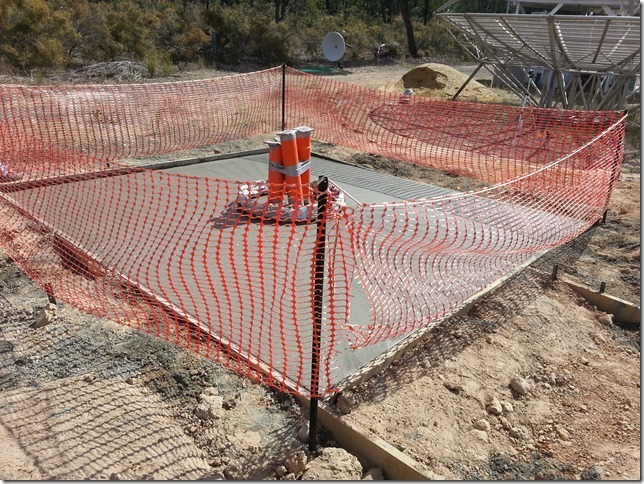 Work was started in February 2017 on the foundations for the 8 meter dish at LMRO. Thanks to a friendly local fellow with a back hoe we managed to get the 4 meter square and 1 meter deep hole excavated ready for setting up the bolt cage and the concrete pour. 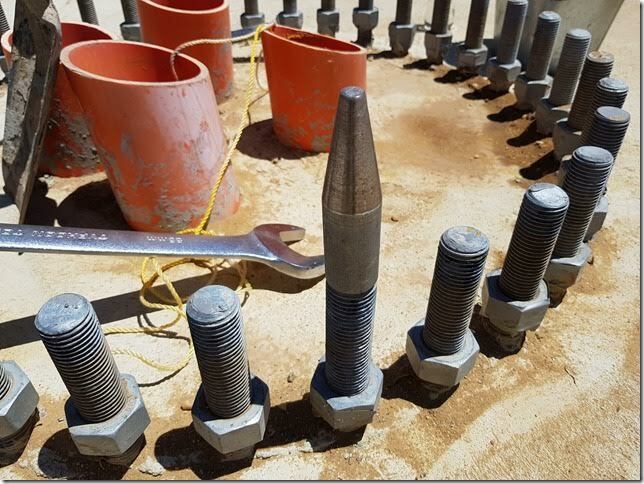 Parts for the bolt cage have arrived on site and a build process has been produced for assembly of the foundations. 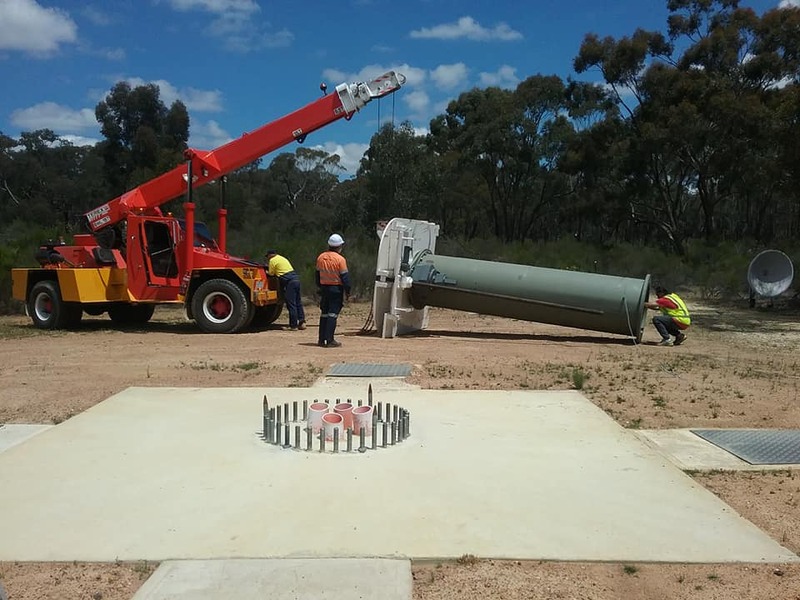 Over the next few weeks the footings for the bolt cage frame, support rings and L shaped bolts will be assembled, formwork around the edge installed and cabling conduits laid ready for inspection. 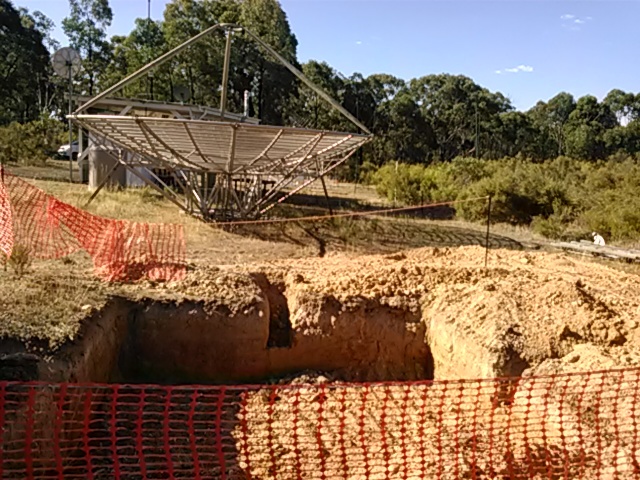 The Astronomical Society of Victoria, Radio Astronomy Section was created in the late 1980s by a small group of dedicated amateur astronomers with an interest in Radio Astronomy. 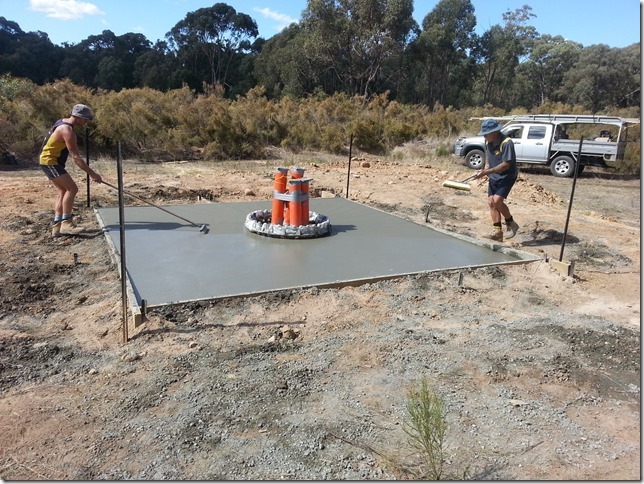 The members worked on projects at a country property in Officer, outer eastern Melbourne. 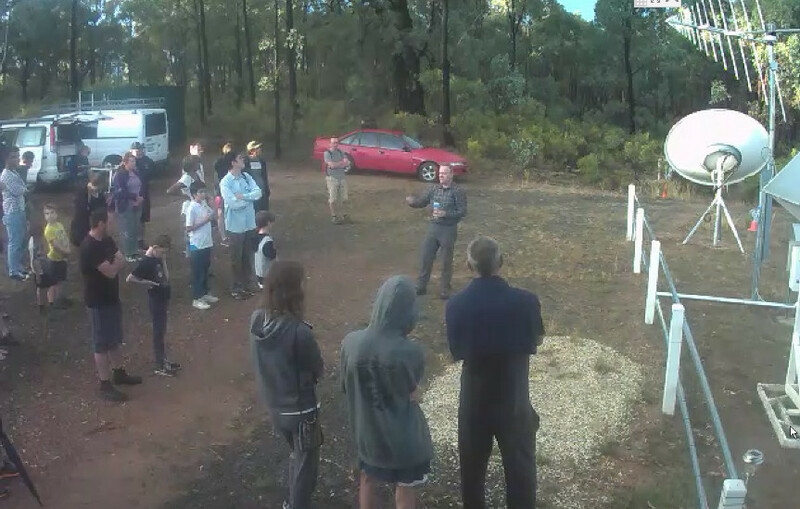 The group then transitioned to their new home at the Leon Mow Dark Sky Site (LMDSS) near Heathcote, central Victoria. The last ten years has seen a great amount of activity at the LMDSS. Delivery of a shipping container and subsequent conversion to a Science Laboratory and Radio Shielded Room. Radio Jove Dipole Antenna installation. Weather Station The weather is monitored with a Davis Weather Station and the measurements are stored and uploaded to a data server. Jove Receiver A dipole antenna tuned to 20MHz is connected to a Radio Jove receiver that listens for Radio Emissions from Jupiter. Lightning A lightning detector from Boltek connects to a program called Nexstorm and images location and strikes of lightning around Victoria. 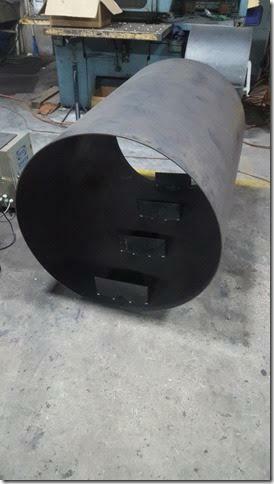 Radiation A radiation detector from BlackCat Systems is used for detection of Gamma Rays. Two GM45 detectors are connected in parallel or 'incidence' mode. 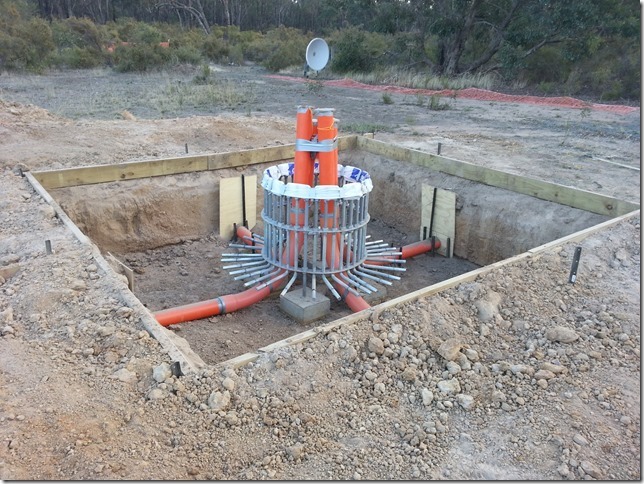 Seismometer An Infiltec seismometer model QM-4.5LV is located at LMRO and is 800mm deep in the ground. 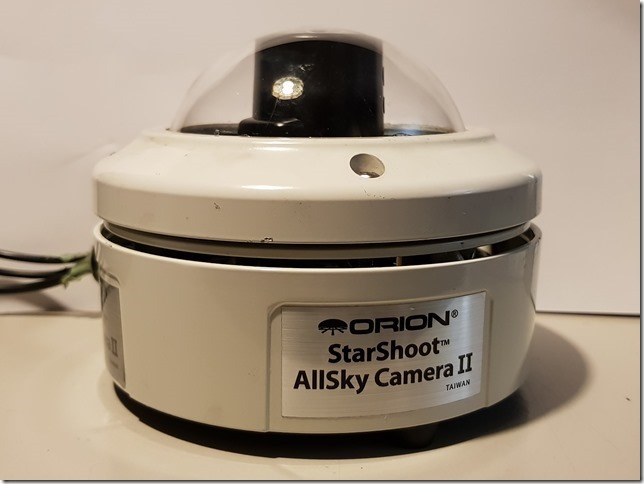 All-Sky Camera Orion Star Shoot All-Sky camera gives superb day and night views of the sky. 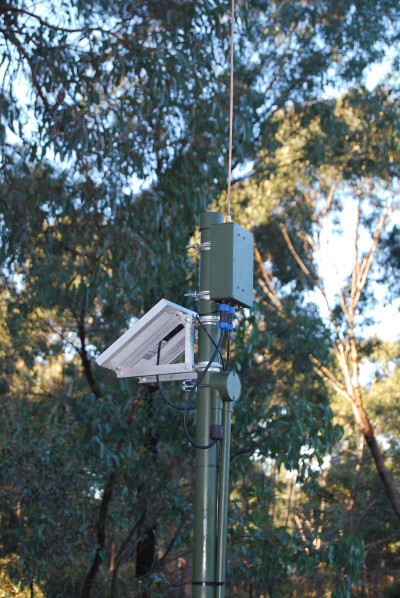 eCallisto Part of a World-Wide network monitoring 45 to 800MHz for Solar Radio Emissions. Magnetometer A three axis magnetometer to monitor Earths Magnetic Field. Whistler Receiver A Very Low Frequency (0 to 12 Kilohertz) receiver designed to receive atmospheric electromagnetic energy.